:: Peanut Press Creative ::: Crochet...Croceht...Crochet till the cows come home! Crochet...Croceht...Crochet till the cows come home! Crochet is something that I've recently picked up and CANNOT put down! Literally! It's one of the most relaxing creative things you can do! I've mainly been making baby headbands and recently started making beanies too! 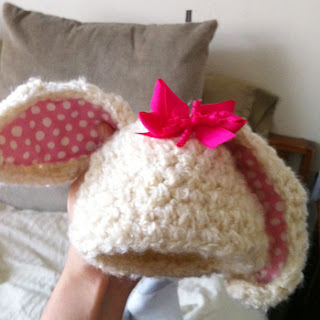 Including this easter beanie for baby Ava!